"Delicious, sustaining, sweet and salty, and a keeper in the library of your heart." "The stories in this lovely book offer endless opportunities for reaching out to others in friendship, care, laughter, and prayer." Filled with inspiring stories that will touch your heart and tickle your funny bone, Let's Be Friends is one woman's journey of what happened when she opened the doors of her home and her heart and said yes to making new friends in new ways. Chapter by chapter, you'll meet dozens of women of all ages, whose lives became entwined with Elizabeth's through book clubs and Bible studies and neighborhood parties and lunches that lasted long past dessert. Where two or three are gathered, food is certain to make an appearance, so you'll also find delicious original recipes sprinkled throughout the pages of Let's Be Friends. 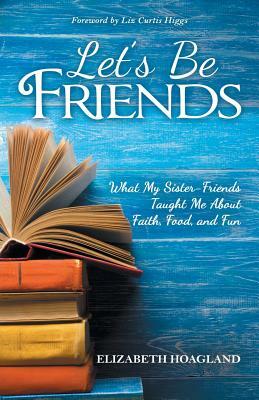 More than simply a collection of entertaining stories, Let's Be Friends: What My Sister-Friends Taught Me about Faith, Food, and Fun offers practical ways to nurture meaningful friendships that will enrich your life and deepen your faith, including creative ideas to try with your own friends and new traditions to make each season bright.